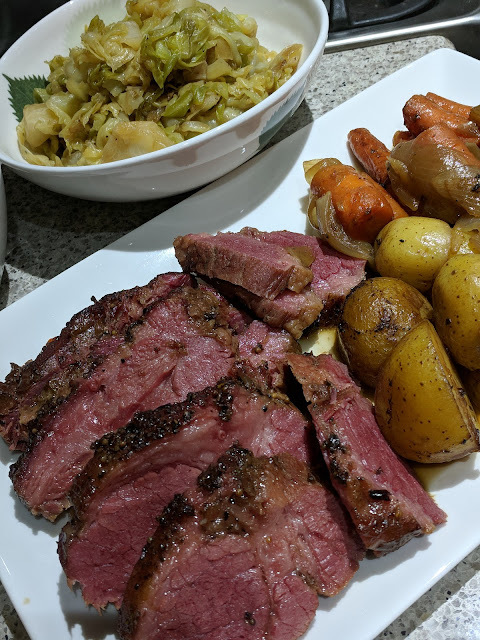 St Patrick's Day is for drinking Guinness and eating corned beef hash and cabbage. So what's better than combining all that together into a hearty meal ... paired with another bottle of Guinness. AND on top of that, all of those items are usually on sale this time of the year so you'll save money on top of that. The perfect combination. Preheat oven to 350F. Remove corned beef hash from packaging. If the beef is unseasoned and comes with the spice packet, rub it over the fatty side of the meat. Season all over with pepper and just the slightest sprinkling of salt. Remember the corned beef hash is sold already brined and salted. Heat a large, oven-safe Dutch oven over high heat. Sear corned beef for 5 minutes on each side. Remove onto a plate and throw in the onions. Stir for a couple minutes to pick up some browning. Throw in the carrots and stir for a couple minutes more, and then the same with the potatoes. Nestle the corned beef amongst the vegetables, along with any pan juices that may have collected onto the plate. Pour in all three bottles of Guinness. You may have to nestle the meat a bit more but the liquid should cover everything about 3/4 of the way. Cover and oven for approx 1 hour per pound. Remove the lid for the last hour or so. 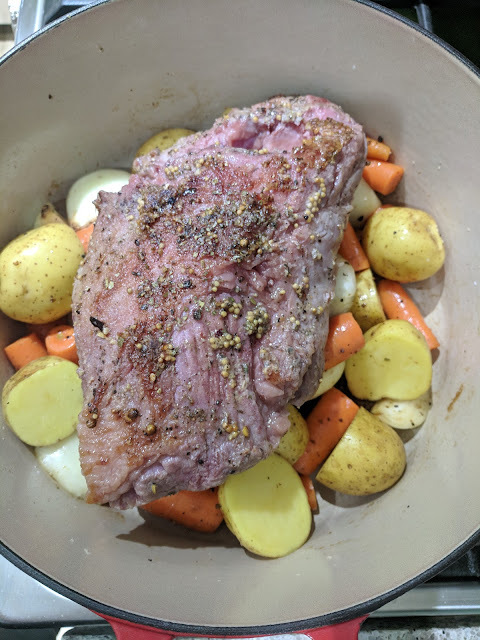 I had a 2.41 corned beef so I cooked it covered for 2 hours and then uncovered for about 30 minutes. When you stick a fork in the meat, it should pierce easily. Remove from oven and let rest for 10-15 minutes before removing the meat and slicing. Serve on a large platter surrounded with the vegetables and some pan juices on the side. Whole grain mustard and horseradish optional.